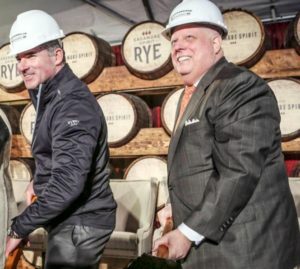 Kevin Plank, the billionaire founder and CEO of Under Armour, is also co-founder of Sagamore Spirit, a new rye whiskey distiller out of Baltimore. Sagamore will showcase its offerings at the George Washington Whiskey Rebellion Fest, brought to you by the Community Trust Foundation. The Fest is scheduled for Friday June 8, 6 to 10 pm, in the Allegany Museum, 3 Pershing St Cumberland MD. Sagamore will offer samples, and the opportunity to buy bottles. Sagamore Rye Whiskey is relatively sweet, with notes of nutmeg and vanilla bean, and made with water the company drives in from its limestone spring at Sagamore Farm. Some has been aging in 53-gallon oak barrels since 2012. Sagamore will provide tastings and sales alongside more than a dozen other distillers of whiskey and other spirits. As well, the Whiskey Rebellion Fest will feature craft beer tastings, alongside the whiskey, rum, vodka and brandy samples. Guests at the Fest will also enjoy continuous servings of canapes by Good Carma catering, an open beer and wine bar, the opportunity to mingle with a nationally-renown George Washington ‘living biographer’, and other reenactors including George’s wife. Tickets also include the opportunity to play Colonial games, win one or more unique luxury items in the silent auction, photos with President Washington, and a goody bag to take home. Sober rides are available. ← Welcome back, Twin Valley!